Keep Your Exempt Status, File Your Extension Form 8868 Before Tonight’s IRS Deadline! If you want to keep your tax-exempt status, first you need to create a free TaxBandits account. 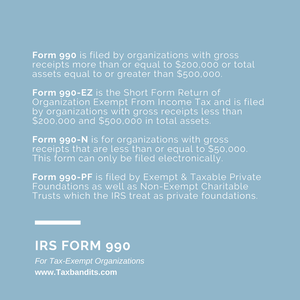 Next, you’ll pick the proper form for your nonprofit from our Form 990 Series returns: Form 990, Form 990-N (e-Postcard), Form 990-EZ, and Form 990-PF. The last thing we want is you wasting time filing the wrong return tax-exempt organization. TaxBandits is designed for easy e-filing, and our interview-style e-filing process can transmit your forms directly to the IRS, so you can sleep well tonight knowing you made the deadline, even if it was at the last minute. If you need more information, this guide to filing a 990 tax form for your nonprofit can help. You have until midnight tonight to get your IRS Form 990 in, but if that brings you more panic than peace there’s an alternative that can stop the walls from closing in. File Extension Form 8868 today. If you’re feeling the pressure of paperwork, here is how to file a Form 8868 to receive additional time. While this IRS tax extension form still needs to be turned in by midnight tonight, it buys you six months to file your Form 990. You filed extension IRS Form 8868, now what? First step: breathe. Next step: write down your new deadline. 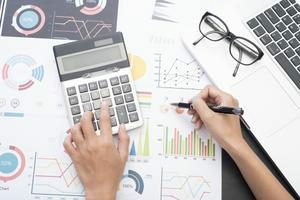 If you’re a fiscal year tax organization, filing the IRS Form 8868 means your new filing deadline the 15th day of the sixth month after your original filing deadline, in this case today. If today helped you realize living on the edge isn’t really your thing (at least when it comes to the IRS), create a free account with Taxbandits. Our step-by-step processes, US-based customer support, and automatic schedules help you stay exempt and stay compliant with the IRS. E-File Form 8868 by tonight’s IRS deadline to keep your tax-exempt status. When is the Extension Form 8809 Required?